On this Mother’s Day, I’d like to share some of my artwork that depict mothers. 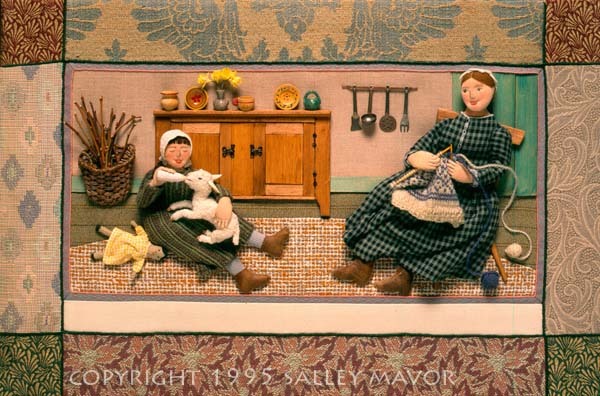 The domestic scene above is an illustration from Mary Had a Little Lamb. And the one below shows the kitchen in my book, In the Heart. 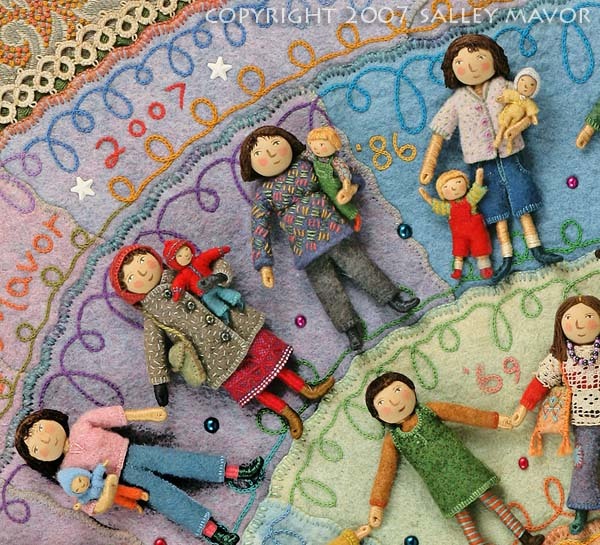 This detail from my Self Portrait: A Personal History of Fashion, covers the years when my children were very young and physically attached to me. 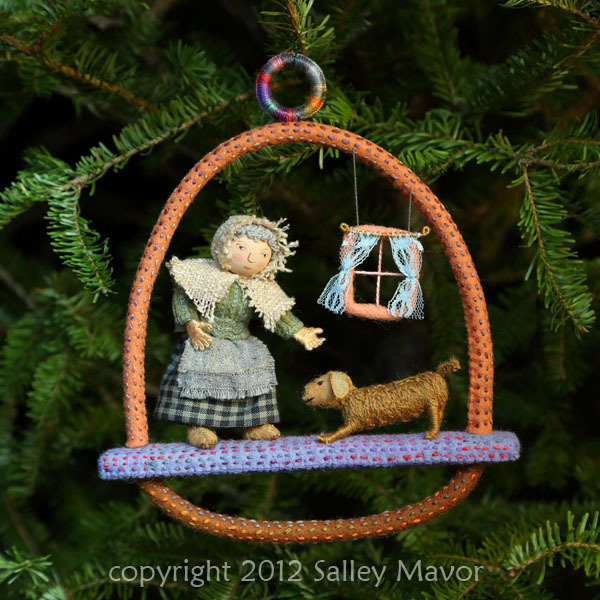 I made this “Old Mother Hubbard” ornament for the Family Trees Exhibit in Concord, MA. And finally, here’s The Old Woman Who Lived in a Shoe, from my book Pocketful of Posies which peels away the sugar coating of motherhood. 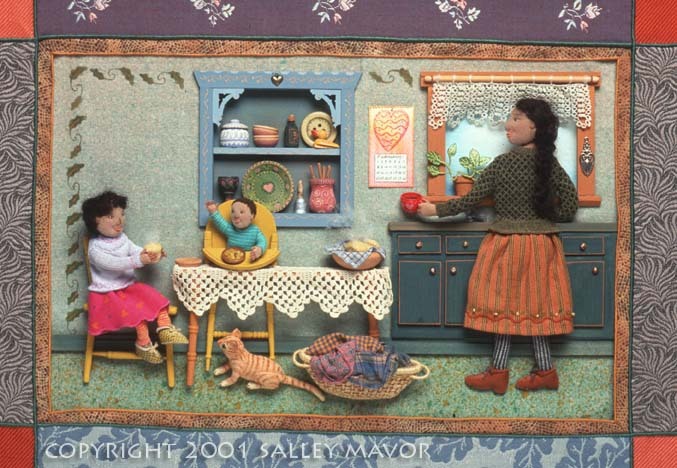 This entry was posted in Children's Books, Embroidery, Fabric Relief, illustration by Salley Mavor. Bookmark the permalink. What beautiful tributes to motherhood. I hope you are having a pleasant day! We’re heading to Encnitas to have lunch with our son. 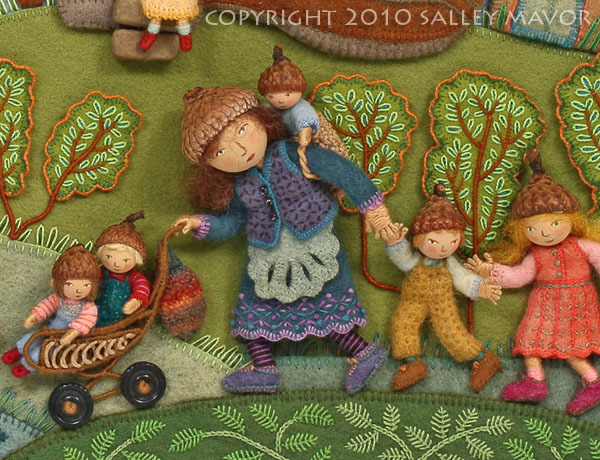 Happy Mother’s Day Salley and to All the Mom’s that post on your Blog!! The more I look at your work the more details I discover. Thank you for always sharing. beautiful work all. happy mother’s day to you! I love close-ups of your work. I am most impressed with your self portrait. I can identify with the age and clothes in most of those. Happy Mother’s Day!!.. You are such a gift to us all. Your mothers and children are so enchanting! Thank you, Salley…it was a sweet gift to see these photos, today!!! What a lovely Mother’s Day greeting, Salley! I love seeing details of your work close-up.